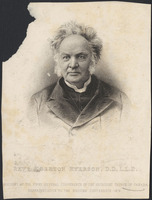 McDONALD, DONALD (the family sometimes spelled their name Macdonald), surveyor and politician; baptized at Caledonia, N.Y., 7 April 1816, son of Alexander McDonald and Margaret McColl; d. Toronto, Ont., 20 Jan. 1879. The McDonald family were residents of the Loch Ness region of Inverness. Donald’s father, Alexander, was one of a group that left Inverness in 1803 and settled on the Holland Land Company’s holdings at Caledonia (then called Northampton) a year later. In 1823 Alexander joined other Scottish families emigrating to Upper Canada. He settled first in the Niagara area, then moved to the township of Dumfries (now North and South Dumfries) near Galt. McDonald joined in the defence of Toronto in the rebellion of 1837 and was present at the assault on John Montgomery’s tavern on 8 December. About 1838 he married Frances, daughter of James Mitchell, judge of the London District Court, and niece of Egerton Ryerson*; they had 14 children. A few years later McDonald had to give up surveying because of rheumatism and was transferred to the clerical staff of the Canada Company, working first at Goderich, then, from at least 1843, at Toronto where he rose to hold the post of assistant commissioner. He built a 26-room house which became one of the social centres of the city, for he and his wife were famous for their hospitality. 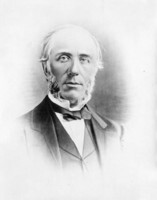 In 1858, when the first election was held for the new Legislative Council seat of Tecumseth (the counties of Huron and Perth), McDonald was nominated by the Reform party to run against his Conservative (ministerialist) opponent, Thomas Mercer Jones*, his former superior at the Canada Company. He won, his majority being obtained in Huron County. The London Free Press stated that he was opposed by the Canada Company; certainly from this time his connection with the company seems to have ended. Jones contested the election, claiming that McDonald had used bribes and had opened taverns to the voters. A hearing was held, at which McDonald’s supporters objected that the presiding judge, Robert Cooper, had campaigned for Jones. A report was forwarded but no action was taken by the government; McDonald was duly seated the next year. McDonald was elected chairman of the committee on finance at the Reform convention of November 1859 [see George Brown]. In a speech he stated that the best solution for Canada’s constitutional problem was the establishment of two or more local governments in federation. He argued that “to be effective we must not be rash” but changes were needed in both government and the men in power. When the Constitutional Reform Association was established to follow up the work of the convention, he was elected treasurer, but he played little part in later events leading to confederation. He was appointed a senator in 1867; he held that office and remained a supporter of the Liberal party until his death. McDonald became a fairly wealthy man, leaving an estate of $141,800, mostly in notes, mortgages, and cash. Although interested in the construction of the Buffalo and Lake Huron Railway and listed in 1873 as a provisional director of the Huron and Ontario Ship Canal Company, he seems to have had little connection with entrepreneurial activities. In 1865 he was elected a director of the Royal Canadian Bank and became vice-president, but in 1869 he got into an acrimonious dispute with some of the other directors over the policy they were pursuing; the subsequent ill-fated course of that corporation probably indicates that he was right. He also owned a 2,000-acre ranch in Kansas where he bred improved shorthorn cattle, and at the end of his life, along with Alexander Campbell* and others, he was speculating in lands in Michigan. In religion McDonald was a Presbyterian, a member of St Andrew’s Church in Toronto. He was a lay trustee of Queen’s College at Kingston from 1868 until 1878. McDonald died in Toronto in 1879 after a year’s illness; his wife and several of his children afterwards went to live in Los Angeles, California. First Presbyterian Church (Caledonia, N.Y.), “Records,” I, baptismal entry for 7 April 1816. Huron County Surrogate Court (Goderich, Ont. ), will of John Macdonald, 26 July 1873. PAO, A. N. Buell papers, 13 April, 1, 15 May 1869; 17 Sept. 1871; C. E. Macdonald papers. University of Western Ontario Library, ULM 56–107 (Minutes of the contested election case of Thomas Mercer Jones versus Donald McDonald). York County Surrogate Court, inventory of the estate of Donald McDonald, 17 May 1879; will of Donald McDonald, 14 June 1877. Globe (Toronto), 10, 12 Nov. 1859; 22 Jan. 1879. Mail (Toronto), 21 Jan. 1879. Dom. ann. reg., 1879, 412. The roll of pupils of Upper Canada College, Toronto, January, 1830, to June, 1916, ed. A. H. Young (Kingston, Ont., 1917), 382–84. Wallace, Macmillan dictionary, 437. Centennial book of the First Presbyterian Church, Caledonia, N. Y. (Caledonia, N.Y., 1906), 16, 50. W. E. Elliott, Huron early houses and their families; Book III (Goderich, Ont., 1969), 12–17. Landmarks of Toronto (Robertson), I, 271; IV, 140–53. C. E. Macdonald, “The clans in Canada,” Scottish Canadian (Toronto), VI (1901), 258–59. A. P. Walker, “John McDonald,” Ont. Land Surveyors Assoc., Annual Report, no.53 (1938), 100–3. Frederick H. Armstrong, “McDONALD, DONALD (d. 1879),” in Dictionary of Canadian Biography, vol. 10, University of Toronto/Université Laval, 2003–, accessed April 20, 2019, http://www.biographi.ca/en/bio/mcdonald_donald_1879_10E.html.